← “From the North” by Al Dronsfield!! Pin Shuffle – St. Louis Style. Sent along by Stu Cassell. 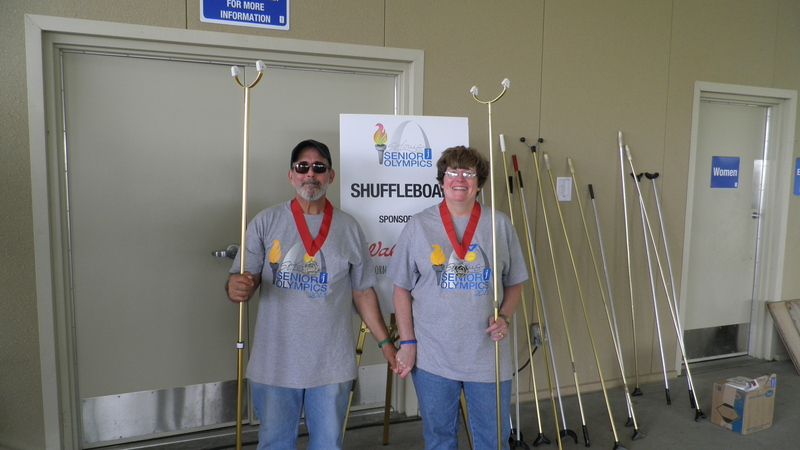 Stu Cassell Speaks: When my wife Rose and I lived in Florida, we joined both the Avon Park Shuffleboard Club as well as the Sebring Shuffleboard Club. We loved playing in both places, and on Friday nights we enjoyed playing Pin Shuffle in Sebring. Our club plays indoors during the winter months at the Gateway Salvation Army Community Center in south St. Louis. In good weather we play outside at Des Peres Park, in Des Peres, Missouri. We’ve chatted about sending a small group of our players to come down to Highlands County to challenge y’all. In the meantime we’ll be at many of the Midwestern Senior Games this year including St. Louis, Perryville, and St. Charles, Missouri, as well as the Indiana State Games. We hope to send as many of our members to the National Senior Games in 2019 as possible. I will always be grateful for the friendship and instruction I received in Avon Park and Sebring playing this wonderful game. 1 Response to Pin Shuffle – St. Louis Style. Sent along by Stu Cassell. We would like to know the rules. What is the penalty for knocking over the pin? Are the rules for everything else other then the pin, same as with regular shuffleboard.